Are we developing relationships with our technology at the expense of our human relationships? When my husband set up his flash new android phone it showed on the display the title of ‘Life Companion’ which struck me as odd since I thought I was his life companion! But it made me think – is this is a sign of our times – are we developing relationships with our technology at the expense of our human relationships? This is an emerging issue that parents themselves are beginning to recognise and grapple with. As the discussion about whether or not to ban smart phones in schools, ricochets around the media, it is a good time to re-examine the relationship that we as parents have with our smartphones. Try out this challenge today – when you pick your child up from school or pre-school, run a physical check on your body – are your hands and arms free to embrace them, stroke them, rub their little injuries, muss up their hair and enfold their little bodies with a warm hug? Or do you have the hard, cold brick of technology firmly placed between you and their overbrimming emotions? In her book The Big Disconnect – Protecting Childhood and Family Relationships in the Digital age, Catherine Steiner Adair, calls on parents to re-think their relationship with their technology and their relationships with the humans in their orbit. In her research Steiner-Adair found that the effect on children when their parents are tied to their smartphone is that they feel sad, isolated and alone. This is reinforced in recent research that has found that the incidence of suicide and decline in mental health in young people began to spike at the same time as the smartphone entered our daily usage. 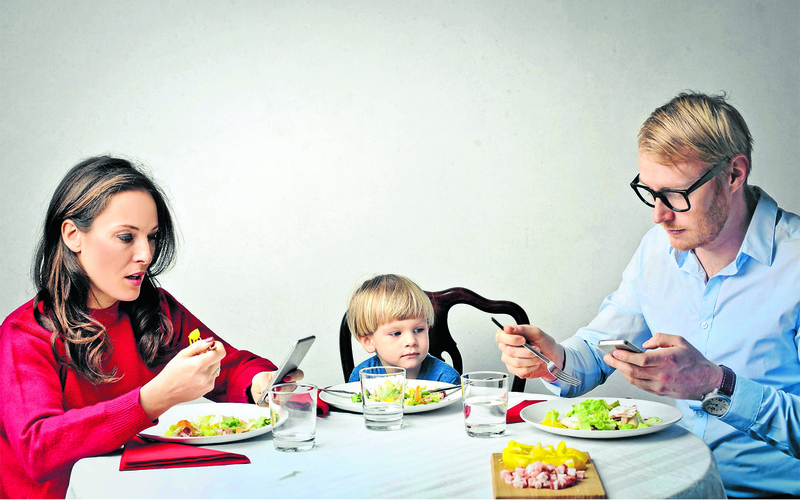 Back in 2015, Pope Francis called parents to come back to the dinner table and put aside their technology saying “Social networking can make us feel that we are well-connected, when in reality we are becoming detached from those closest to us as autonomous individuals rather than as members of a family”. So ask yourself this – are you a member of a ‘family’ the type Pope Francis speaks about or are you trying to be an ‘insta family’ – the online version (Instagram) of the family that portrays the perfect picture of family bliss, shiny teeth, rosy cheeks, pressed clothes all set in conjured settings that are held up as the ideal. Inevitably, parents today feel a pressure to be perfect when there are ‘insta families’ to be compared to. But instead of gauging our perfectness by the image we see in our smartphone – look at the image reflected in the eyes of our children and partners. Is there a caring, interested parent looking back or a distracted, disinterested silhouette in the distance? Previous articleSimcha Fisher: Should you go into debt to get a liberal arts degree?